The Fellowes Powershred 62MC Micro-Cut Shredder shreds an A4 sheet into approximately 2000 pieces measuring just 3 x 10mm each. 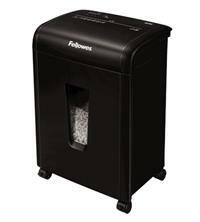 This gives it a P-5 security rating, great for shredding your highly confidential and secret documents. The shredder will take up to 10 sheets of 70gsm paper at a time and will also shred staples and credit cards too. The 19 litre bin is pull-out for easy disposal of paper waste - and it features a handy see-through window so you can see when the shredder is getting full. A safety lock feature allows you to manually disable the shredder and prevent accidental activation - and the shredder will shred for up to 7 minutes continuously before it requires a 60 minute cool down period. Other features include: Castors so you can easily move the machine; an overheat indicator; and a 230mm paper throat width (for A4 shredding). Ideal for personal deskside use, the Fellowes Powershred 62MC Micro-Cut Shredder is great for medium usage requirements (in the home or small office) and comes with a 2 year machine warranty and 5 year cutting blade warranty.